Traditionally, Wednesday of Holy week is a day to think about Judas and his relationship to Jesus. 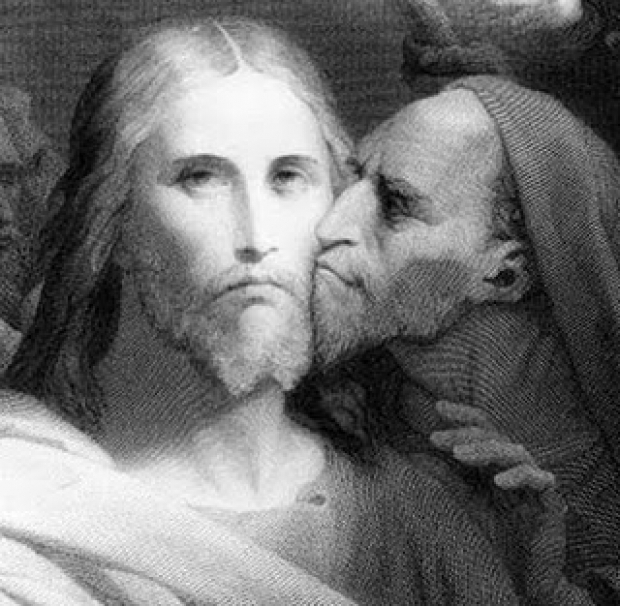 It is often called Spy Wednesday and it commemorates the the night Judas agreed to hand Jesus over to the authorities. This sets in motion the events that result in Jesus’ crucifixion. What remains so striking about the Judas story is how someone who had sacrificed so much of his life and chosen to follow and live closely with Jesus would ultimately betray him in the worst way. What could possibly have been unfolding in Judas’ mind and heart that made him think that turning Jesus over to the authorities was a good idea? What was the deal breaker for Judas? What, I wonder, would be the deal breaker for me? I wonder if his disappointments and frustrations were like Peter’s who tried to rebuke Jesus when Jesus first started talking about this crucifixion business in Mark chapter 8. Peter wasn’t just anticipating revolution, he was anticipating a certain kind of revolution and in his mind, Jesus idea about starting a revolution by getting crucified was….. whack? But the more striking part of the story is what Jesus’ response was. Different gospels give us the impression that Jesus knew full well that one of his own was a traitor. What we do know for certain is that by the time Jesus gathers with the disciples he knows that the betrayal plan has already been made. Jesus knew he was sitting with a traitor. And for folks like me who are a little slow on the uptake, Jesus made sure we knew he was being an example. Here we are in a moment in time in which Christians are making effort to remember the most definitive moments of his life. And just in case we miss it, Jesus is quite explicit in telling all of the disciples he is setting an example for us. …And he serves the one who betrayed him. …And he tells us he is setting an example. Jesus’ instructions to his followers to be the servant of all is…relentless. (Mark 9:35, Mark 10:44, Matthew 23:11, never mind all the passages in books other than the gospels like Galatians 5:13). What I have come to believe is one of the truest things about the universe is that Jesus loves and serves relentlessly, even those who betray him, even those who won’t go on to being servants themselves. Relentless. During Lent this year I have tried to imagine myself as one who would be transformed by that unstoppable love and go one to serve others relentlessly. Um…. I still have some growing to do. It hasn’t gone well. If anything, all that has really happened is that I have become aware of how much I really rely on the love of God to transform me when my will-power alone doesn’t get me there. Even as much as I want to be a servant (theoretically speaking) my attempts to grow in humility only seem to emphasize more than ever how short sighted and entitled I can become. I am gifted at my ability to move quickly toward resentment even when my intention was to spend a relatively short period of my life trying to practice humility. Ugh. I have to be honest, I am a little heart broken, as well as a lot confused, during Holy Week this year, that the main place that Christians are in the news in the US are folks trying defend a right…to not serve some people. I suppose we could enter into a pretty complex debate all that that means and why it is the case and who feels like they are protecting whom from whatever dark forces. What I know from sitting here is that it just doesn’t smell like servanthood. It doesn’t smell like relentless love. 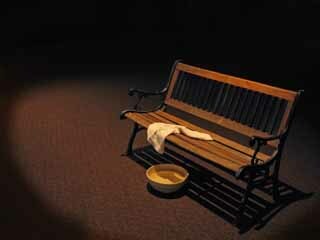 I don’t mean to be sitting here casting stones… that doesn’t smell like servanthood either. On the contrary, I get it, serving is hard and sometimes terrifying. But whether we like it or not, it is our call if we follow Jesus. It is also our honor and a grace to us when we start to understand what it means. If you are one of the people that feels passionately about passing laws the protect Christians from having to serve certain people for whatever reason, I must confess, that just does’t smell like Jesus to me. 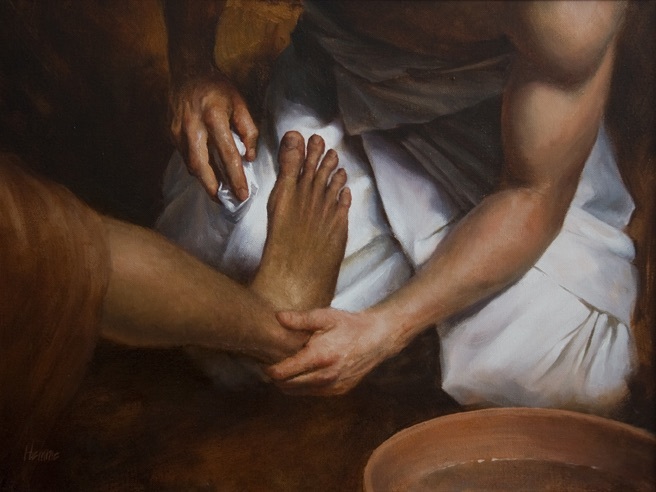 I am more than willing to be proven wrong but the example we have of God kneeling before his betrayer to wash his feet or of Jesus healing the ear of one who came with the intent to subdue him is… a far cry from being asked to arrange some flowers or bake a cake… for which one would presumably still get paid. I am not saying this is easy. I know how hard servanthood can be when you take it seriously. I know because of how much I struggle with true humility. I know that servanthood is in fact terrifying when it is most important. I know because I am often terrified. 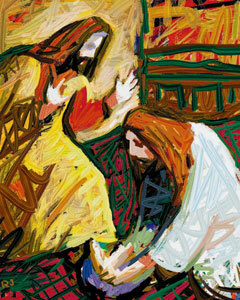 Nothing about Jesus’ Crucifixion that we are contemplating this week seems to indicate that the Christian life is easy. What I am saying is, and really all that I am saying is, God’s love is relentless. relentless. And God’s service to me is profound. Because of that, I trust him. So count me in. Isn’t it a good thing that we have the relentless love of God hounding us and serving us, even when we don’t deserve it? That is when I need it most. Thank you for posting this week, in particular; a time when I really needed it!! Amazing, and moving, thanks Doug!